Note: This method computes everything by hand, step by step. For most people, the new API for fuzzy systems will be preferable. The same problem is solved with the new API in this example. The ‘tipping problem’ is commonly used to illustrate the power of fuzzy logic principles to generate complex behavior from a compact, intuitive set of expert rules. If the food is great OR the service is amazing, then the tip will be high. Most people would agree on these rules, but the rules are fuzzy. 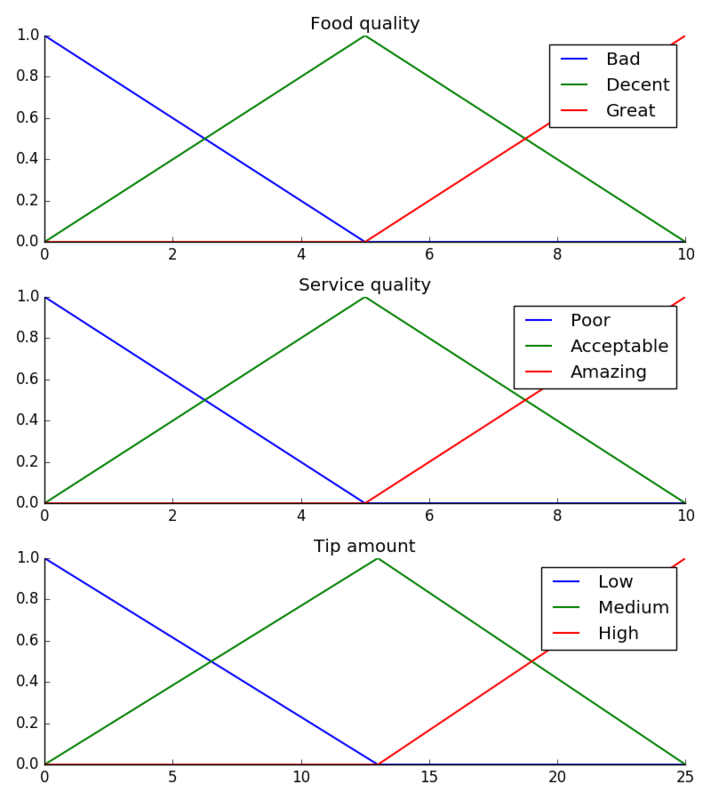 Mapping the imprecise rules into a defined, actionable tip is a challenge. This is the kind of task at which fuzzy logic excels. # We need the activation of our fuzzy membership functions at these values. # This is what fuzz.interp_membership exists for! # Now we take our rules and apply them. Rule 1 concerns bad food OR service. # The OR operator means we take the maximum of these two. With the activity of each output membership function known, all output membership functions must be combined. This is typically done using a maximum operator. This step is also known as aggregation. Finally, to get a real world answer, we return to crisp logic from the world of fuzzy membership functions. For the purposes of this example the centroid method will be used. The power of fuzzy systems is allowing complicated, intuitive behavior based on a sparse system of rules with minimal overhead. Note our membership function universes were coarse, only defined at the integers, but fuzz.interp_membership allowed the effective resolution to increase on demand. This system can respond to arbitrarily small changes in inputs, and the processing burden is minimal. The result is a tip of 20.2%.